If you haven’t got the stomach for a story that includes a hurricane, a signalling device, hungry leeches, cold cucumber soup, a horrible villain, and a doll named Pretty Penny, then this book will probably fill you with despair.I will continue to record these tragic tales, for that is what I do. You, however, should decide for yourself whether you can possibly endure this miserable story (goodreads.com). After the devastation of losing their most favorite caregiver since their parents, Violet, Klaus, and Sunny are taken under the care of their “Aunt” Josephine, whom is quite a character. After getting to know their aunt and realizing that they kind of like her, terrible events start to occur. First, they meet the not-so-mysterious-to-them Captain Sham who figures out a way to weazel his way into their lives. From the start the children know that he is up to something, but they have to figure out what it is. After receiving a phone call and being shooed out of the room the children are horrified after hearing a window break. To them it appears that their aunt had jumped out of a window and left a note behind, but that may or may not be entirely accurate. The children spend all their time trying to figure out what happened to Aunt Josephine so they don’t end up under the care of Captain Sham. I thought the pace of this story was perfect, as was the detail of the story. There was quite a bit going on but it never felt rushed. I also found the plot of this book to be very interesting mostly because I loved the children’s aunt as a character because she is hilarious. This book I believe was also quite a bit funnier than the others, otherwise I am just getting better at finding all the humor contained within these stories. This book wasn’t too dark, but like all the others someone is murdered, but its never graphic. In this case, the children don’t even get to see the body and the murder occurs near the end of the story. As always, the Baudlaire children are incredibly intelligent and resourceful. There are so many things that Sunny can do, which would be impossible, but its what makes the story so funny. She actually helps bail water out of a boat and manages to sneak in a shack and steal keys from a sleeping man and get back out again. There are a lot of other amazing things she can for some reason do, but you have to discover those for yourselves. Violet can think of things very quickly that help them get out of trouble, and Klaus can pretty much figure out any puzzle he is given. Aunt Josephine is the new character in this book and I found her to be incredibly hilarious as well as frustrating. She is obsessed with grammar and can’t stand the fact that Sunny babbles. She tries to teach Sunny how to actually speak, but Sunny is too young (so funny). She also has a huge library that contains every book on grammar that you could ever need and the children quite enjoy it nonetheless. The funniest thing about their new caregiver is she is afraid of everything! It is completely irrational (which the author explains in detail) and frustrates the children as well as the reader. The problem with her as a caregiver is that because she is terrified of everything the children are miserable, frustrated, and upset. They can’t have heat or even a hot meal! She even goes as far as offering them as a sacrifice to save her own skin. She is one of the worst caregivers they children have had so far. Again, Count Olaf attempts to hide his identity, which the adults always believe, but the children know from the beginning who he really is. This time he dresses up as a captain and even goes as far as having a peg leg (to hide his most identifying feature). This poses a problem for the children because it is always the way in which they uncover his true identity, but without a leg how are they going to do it? I adore the characters in this series so far, but I really wish that Count Olaf was more of a gray character, but by this time we know he is completely evil. Again, the author explains many different things, which helps the reader understand the book more and makes it funny and entertaining. In this particular story Snicket explains the difference between rational and irrational fears (because Josephine’s fears are so irrational), but the way in which the author does so is super funny (apparently monsters under the bed are a rational fear!). 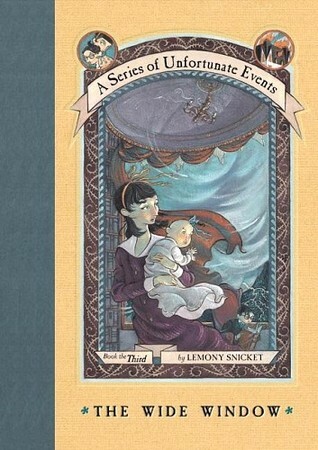 Snicket also mentions a complaint he received from the publishers and clears that up (hilarious), explains the term “Speak of the Devil” , which children may not understand and even tries to explain the moral of this story. I love how the author is able to make reading so much fun and even though I am an adult and know all these terms and don’t need them explained, he makes it so funny that I actually enjoy reading his explanations. They don’t at all disrupt the flow of the story. This is a great addition to the series! It’s fun and entertaining, and will be enjoyed by children and adults alike even though the structure of each book is so similar. Check out these other reviews by fellow bloggers!